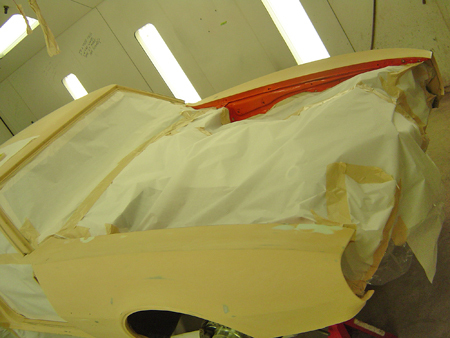 Paint is an important part of any restoration, but in the Resto-Mod world, it is everything. You do not see Resto-Mods at SEMA, World of Wheels events or the Hot Rod & Restoration Show with "so-so" paint. In fact, you don't even see them with "average" paint. They all glow with the latest and greatest finishes, often set off by subtle "how-did-you-ever-do-that" ghost flames and "chameleon" colors that trick your eyes and tease your senses. When you build a Resto-Mod you're competing with the Fooses and Jesse James' of the trade and though you can't match their budgets, you've got to be at the top of your game to even play. 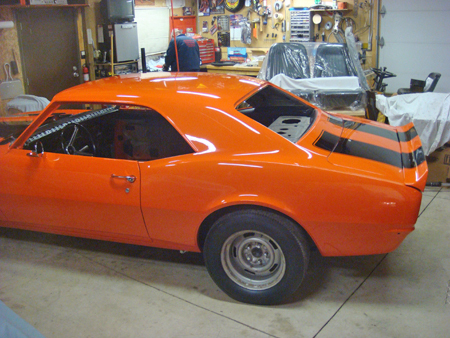 Jeff Noll understood a Resto-Mod has to be done right. He hired a professional to apply paint. 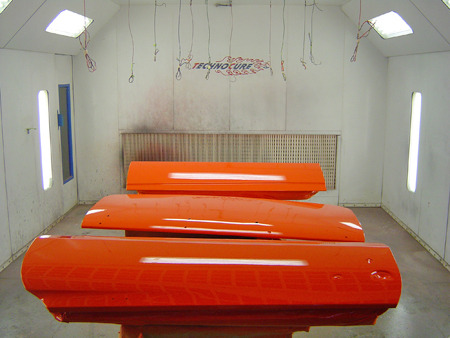 The first orange paint was sprayed in the engine bay. By starting your build, you've accepted the challenge of creating a car that shows off every ounce of talent you possess. Where it comes to paint, that means shooting for the extraordinary in every sense of that 13-letter word. Since you can't win by virtue of having the fattest checkbook, you've got to do it with passion and soul. You've got to approach the job of adding color to your car with the attitude that you are going to do the best job you possibly can with whatever you've got to work with. Put a lot of thought into all phases of the job ahead. Pick your colors carefully. Read all the steps and cautions on the paint product information sheets. If you're squirting the paint yourself, review your skills. If you're having the paint done by someone you feel is more talented, buy them a nice dinner and give them the most inspiring pep talk you've ever delivered. Read articles and books about painting. Check out every Website you can find. Do your homework. All of this planning will help you to do your best. Start with an understanding of the products you'll be using. Your reading will tell you that pigments, binders and solvents are the important ingredients in automotive paint. Pigments add color to the product. 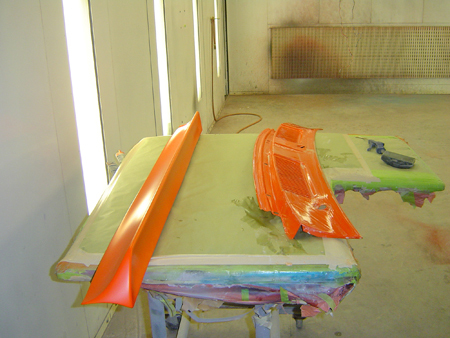 Binders hold the pigments together and help them adhere to the car body. Solvents (a.k.a. 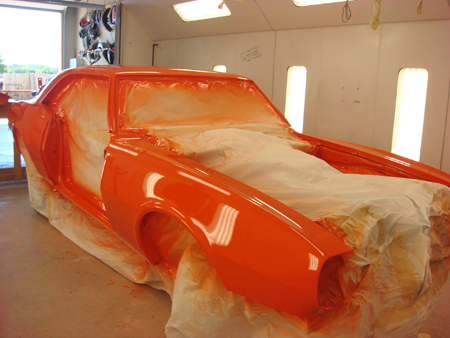 thinners or reducers) convert solid pigments and binders into a liquid that you can spray on a car with a gun. The solvents then evaporate, leaving the solids on the car. Due to government regulation, cars are rarely painted with simple to use enamels or lacquers today. 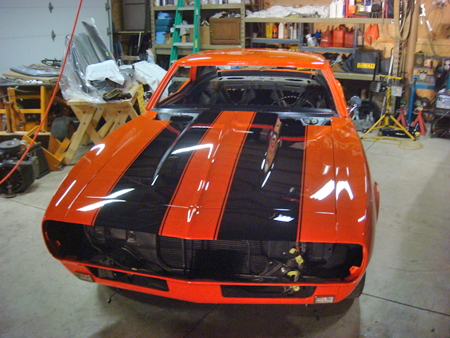 Paint manufacturers have been forced to invent other types of finishes that cost a lot more than old-time auto paints. Along the way, they have put lots of research into developing products that look great and still have the advantages of the old enamels and lacquers such as quick drying times, durability and good coverage. Though their chemical make ups are changed, these paints are still made up of pigments, binders and solvents. Our library contains a 1955 Popular Mechanics Do-It-Yourself Encyclopedia with an article called "Car Painting." It gives instructions on how to brush paint a car with enamel and how to paint spray a car outdoors with lacquer. How things have changed! Today we have multi-stage paint systems. At SEMA 2010. Wanda paint company displayed a fender showing four steps of a modern multi-stage paint job: primer, color, VOC clear and final clear. 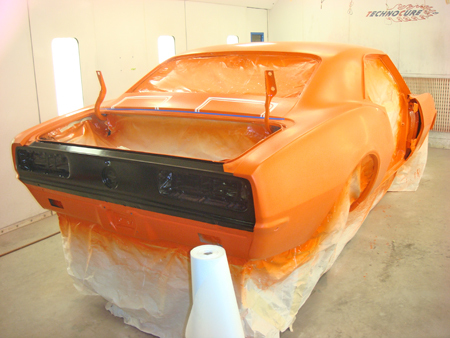 Two-stage base coat-clear coat systems are probably most popular with Resto-Mod builders today. Some modern three-stage systems involve the application of two base coats and the first base coat changes the color of the toner coat (the second coat) before the clear coat is applied. 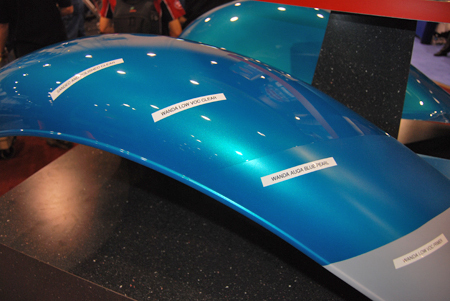 At SEMA 2010, Wanda Refinishing (https://wandarefinish.us) displayed a fender showing four steps of a modern paint job. The first step was the application of Wanda's Low VOC gray primer. The second was a color coat with Wanda Aqua Blue Pearl. Wanda Low VOC Clear was sprayed over the color in step three and the final step was the clearcoat after sanding and polishing. 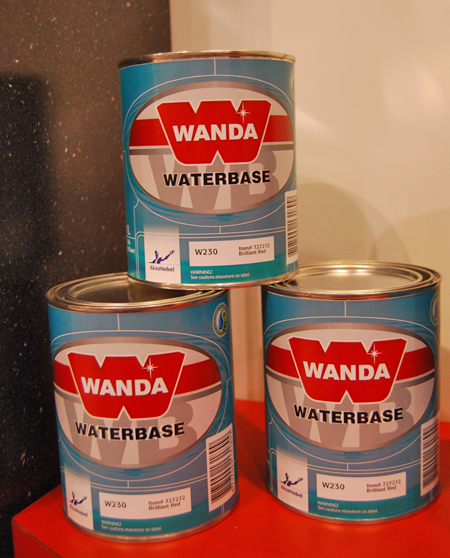 Another new departure in paints seen at SEMA was Wanda's waterbase VOC-compliant basecoat system. VOC means volatile organic compound, a solvent emission the EPA doesn't like. The latest thing in automotive paint is the waterbase VOC-compliant basecoat system which body shops in some areas are using to meet regulations.